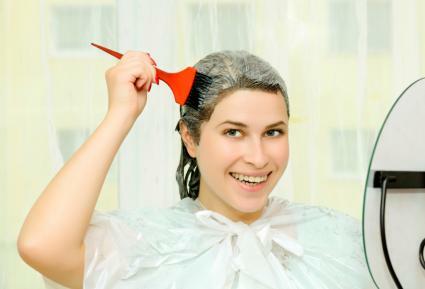 Coloring your hair at home can save you time and money. However, it's easy to feel intimidated when you're left to your own devices in your bathroom with only a box and some folded instructions. It may seem like it makes sense to wash your hair before you color, but the oils on your scalp will actually protect your skin from becoming irritated when you apply the product. If your hair is too clean, you may experience tingling and discomfort. While you shouldn't purposely apply the hair dye to your skin, the product can easily get on your skin during the application process. It's much better-and more comfortable-if you didn't just use shampoo to wash away all those natural oils. You never know how your hair or skin will react to a dye, even a dye from the same brand as your current shade. Do a test strand and allergy test each time before you try a new color to avoid adverse reactions or a hair color you're not proud to sport. For the strand test, trim a piece of hair from near the nape of your neck and tape it to a piece of paper, then apply a small amount of the hair dye. This will allow you to see how the color will look when applied to your current shade. For the allergy test, use a cotton swab to apply a little bit of the dye to clean skin, preferably the inner elbow, and leave it for 48 hours. If your test strand is the gorgeous color you'd hoped for and your skin has no reaction, you've found your next color! Protecting your skin goes beyond the old t-shirt you'll use to cover your shoulders. You'll want to protect your forehead, ears, and the sides of your face while applying color. Take petroleum jelly and apply it around your hairline, all the way around, and be sure to apply some to your ears, too. This will create a barrier between the color and your skin so it will easily wipe away. Nobody likes flat color, but since it's difficult to achieve the perfect placement of highlights and seamless color from top to bottom when coloring your own hair, multi-dimensional formulas are a good option. They can give the appearance of subtle highlights and lowlights. Clairol Nice n' Easy or L'Oreal Feria are good brands to try. The only way you can lighten your hair at home is by using a permanent color or highlighting kit. Don't purchase a demi-permanent shade (like the ones that wash out in 28 shampoos) and expect to see a drastic difference. The tone of your current shade may change - for example, you may be able to shift a medium-dark ash brown to auburn - but it won't get any lighter. Don't go more than two or three shades lighter or darker than your current hair color when coloring your hair at home. The more drastic changes should be left to the pros. These types of changes could even take multiple trips to a professional for color layering. For example, you're going to need more than one visit to get from black to blonde because the process is so harsh it can't be done all in one day. If you were to try to go straight from blonde to black at home, you'd miss out on some of the underlying red tones that may need to be applied first in order to make the color look rich, natural, and beautiful. A few days before you plan to color your hair, apply a deep conditioning treatment so your hair is as moist and ready to grab and hold the color you're going to apply. There are two problems with applying color to dry, damaged hair. First, the strands soak up color like a sponge, leaving you with a darker shade than you intended to have. On the opposite end of the spectrum, once you start to wash it, the color won't stay. There's very little time when you get to enjoy the rich, gorgeous shade you planned to have for the next couple of months. There are several things you need to do before you're ready to successfully color your hair at home. Cover your floor with towels before you get started. Applying hair color is messy, no matter how careful you are. It may drip or you may accidentally fling droplets as you run the color through your hair. Make sure you have everything you need before you get started-a timer, foil or plastic wrap if you need it, gloves, scissors to open the conditioner that probably came with the dye, etc. Leaving your hair down and then trying to get all the strands covered from top to bottom can leave you with areas that don't get the same amount of color as others. Instead, section your hair for the easiest application - so you can make sure each section is saturated with color before moving on to the next area. Divide those sections again, drawing a line from ear to ear over the crown of your head with the point on a rattail comb. The ends are oldest and have been subjected to the most abuse from heat styling, weather changes, sun, and so on. That means they're the most porous and can easily soak up the color. Pay attention to the directions that come in the box with your dye and run the color through the ends only for the number of minutes they say (usually around five) and then wash all the dye out. This is especially important if your hair is bleached or highlighted and you're applying a darker shade. If you do make a mistake and your hair grabs onto too much color at once, you can wash with liquid dish soap. It's harsh enough to strip away some of the excess color (and worth a try before you pay a professional to fix it). However, keep in mind how damaging the dish detergent can be and only apply if there's no way you can handle the depth of the color for a few days until it lightens up gradually on its own. If you use dish soap, deep condition your hair afterwards. Regardless of whether you went to a salon or did your color at home, you generally want to make the color last as long as possible. Choose products that protect your hair color, avoid spending too much time in the sun without your strands covered up, and rinse with lukewarm or cool water in the shower.